We develop and apply modern optical technologies to microscopic imaging of 3-dimensional cell cultures, tissue models and small animals. Volumetric optical coherence microscopy (OCM) and holoscopy are used for high speed, high resolution intravital imaging of tissue morphology. Multiphoton microscopy adds functional contrast and allows for specific staining. Current technological developments aim to increase resolution and imaging speed by aberration correction and multimodal imaging. Main limitation of optical imaging is the strong light scattering which makes only the upper few millimeters of tissue accessible. 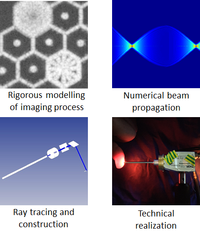 Endoscopic probes are currently under development to extend optical microscopy to inner surfaces. Providing cellular resolution and reasonable imaging speed with compact probes sizes are the main challenges. The new imaging technologies are developed together with the different institutes and clinics for investigating function and immune responses in the eye, the airways, the skin, the small intestine and the brain. Spahr H., Hillmann D., Hain C., Pfäffle C., Sudkamp H., Franke G., and Hüttmann G. (2015). Imaging pulse wave propagation in human retinal vessels using full-field swept-source optical coherence tomography. Opt Lett 40, 4771-4774. Klinger A., Krapf L., Orzekowsky-Schroeder R., Koop N., Vogel A., and Hüttmann G. (2015). Intravital autofluorescence 2-photon microscopy of murine intestinal mucosa with ultra-broadband femtosecond laser pulse excitation: image quality, photodamage, and inflammation. J Biomed Opt 20, 116001. Ansari R., Buj C., Pieper M., Konig P., Schweikard A., and Hüttmann G. (2015). Micro-anatomical and functional assessment of ciliated epithelium in mouse trachea using optical coherence phase microscopy. Optics Express 23, 23217-23224. Hillmann D., Franke G., Lührs C., Koch P., and Hüttmann G. (2012). Efficient Holoscopy image reconstruction. Optics Express 20, 21247-21263. Orzekowsky-Schroeder R., Klinger A., Martensen B., Blessenohl M., Gebert A., Vogel A., and Hüttmann G. (2011). In vivo spectral imaging of different cell types in the small intestine by two-photon excited autofluorescence. J Biomed Opt 16, 116025.